It will be a five-nominee year for the Best Animated Feature Oscar. 18 films were sent in for a chance at nomination for the award, and all were accepted. The motion-capture debate seems to have been for naught; all three films under question were accepted, though only one is a contender. All main contenders have been released to theatres (The Adventures of Tintin debuted in Europe late last month), so all the cards are on the table. For instance, we know that the Cars 2 versus Happy Feet Two rematch has been called off. I wrote a while back that if The Adventures of Tintin were accepted by the Academy as an animated feature, all bets were off. Now, I still think Rango has the statuette come February. I've been predicting a Best Picture nomination for Rango since the beginning; this year, there are two movies the Animation Branch can nominate for Best Picture without having to turn in their Academy membership the day after the nominees are announced. One is Rango, the other is The Adventures of Tintin. At this point, both would be playing for nomination only; actually winning Best Picture is out of the question. Maybe someday. The smart money is that one of these two movies will be the next Animated Best Feature Oscar winner. Obviously, if one gets the Best Picture nomination and the other one does not, well, put your money on the Best Picture nominee. If neither gets the nomination, however, the one to watch would be the pair of Best Screenplay awards. Seven of the ten Best Animated Features have also gained a screenplay nomination, though none have won it yet. Rango has the advantage here, since screenwriter John Logan has already been nominated for Best Screenplay awards. I also wrote, way back when, that Puss in Boots may surprise us all. Suffice it to say, it surprised me. However, DreamWorks Animation has two movies in play this year, and I still feel Kung Fu Panda 2 was the better movie. I do not think DreamWorks will get two nominations. One or the other will take a spot. 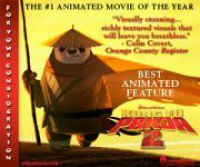 DreamWorks itself has given equal ad space to both movies in their ”For Your Consideration” campaigns; I picked Kung Fu Panda 2 as an illustration, not them. Way back when, I also wrote some witticism about Winnie the Pooh not being as good as its reviews made it out to be, and kicking cats. Well, having finally seen the movie, I can say the only one who deserves to be kicked is me. Completely enjoyable movie. I have been loyal to it in my predictions sight unseen based on the studio; now I know it actually deserves it. In this month’s rotating fifth spot, I add Arthur Christmas to my nominee predictions. It has become tied for best reviewed animated movie of the year (this could easily change as more reviews come in). It also takes the “obligatory foreign film” spot, as Aardman Animations is British. Oh, by the way, Donkey will not be hosting the Academy Awards show after all. Not much going on here; Puss in Boots is pretty much guaranteed a nomination. This year, instead of struggling to find five movies featuring anthropomorphic animals, never mind quality, there is a surplus of deserving movies. This is a good thing after two years won by movies that arguably did not feature furries at all. The only place Cars 2 is likely to get traction, and only as a ”welcome back” vote. Also a much less likely place to see The Adventures of Tintin. Other than that, much the same as the Oscars, except the award will go to a pedigreed animation studio, not the newcomers behind Rango.